“Dog food formulas marketed for ‘seniors’ aren’t based on much science or even a solid set of guidelines outlining the general nutritional requirements for all aging dogs. It seems that pet food manufacturers are not on the same page. Manufacturers may market their own formulations as “senior pet food” despite having vastly differing nutritional compositions. On top of that, every animal is not the same. Some have issues keeping their weight down (especially after years of poor nutrition from these same pet food makers) while some have issues keeping weight on. Some have digestive issues, some don’t. 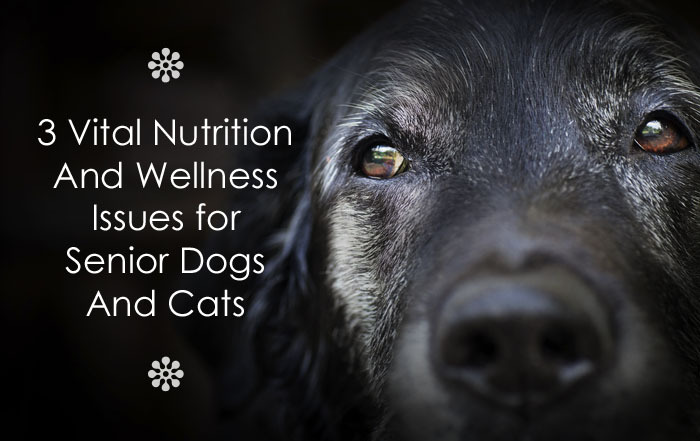 Realizing that the issues or problems are not the same for every dog or cat, and that pet food companies are not providing a viable solution, what are some core and underlying health issues we should be mindful of for our beloved older pets? As Dr. Becker mentions, the fibre added to a commercial senior’s formula may likely cause your pet to poop more but it does nothing to help their intestines absorb critical nutrients. In fact, this low quality fibre may block the digestive system from absorbing necessary vitamins and minerals. High quality fibre from sources such as flax, sunflower and sesame seeds, will promote intestinal health by enhancing nutrient absorption and bioavailability, and binding and removing toxins. Supporting your senior dog or cat’s immune system will be vital in their ability to stave off sickness and stay vital and healthy as they age. A raw, fresh diet, will be a great foundation for a healthy immune system. Limiting drug use, whenever possible, will prevent your pet’s immune functions from being damaged. Prebiotics (nourishes the good bacteria already in the large bowel or colon) and probiotics (promotes the growth of beneficial microorganisms in the intestines) are a wonderful addition to your pet’s food. Clearly, older animals need support with their joints and structural health. We don’t have to look farther than our own human limbs to know that we get a bit creaky and less agile as we age. Commercially processed pet foods destroy much of the vital Omega-3 fatty acids during manufacturing process. These fatty acids, along with ingredients including Glucosamine sulfate, MSM and chondroitin are very supportive of your older pet’s joints and connective tissue. Your dogs and cats are all unique. As they age, they may have one health issue or another, depending on their breed and the quality of their health and nutrition throughout the span of their life. Looking after the health of their digestive system, immune system and joints will go a long way towards a healthier, more vital and enjoyable life for your senior pets.